During school holidays the Museum offers a small number of work experience placements for students to spend a week finding out more about working at the Museum. This can vary from helping with the Sensational Butterflies exhibition to helping researchers or curators like myself behind the scenes. During the February half term this year I had two excellent students who came and helped me for the week in the Fossil Fish Section. Below James and Derek tell us what they got up to during the week here. Getting a work experience placement at the Natural History Museum was great, to get another was a dream come true. However, this time rather than look for damage in the jaws of fossil fish (as I did in a previous placement), Derek and I worked on finding type specimens (those which represent a certain species) to be photographed. These specimens were discovered by Arthur Smith Woodward, a fossil fish specialist who was the focus of the Woodward150 symposium at the Museum on 21 May. Of course, considering these were holotypes and very old we had to take extra care of them and make sure we did not damage them. As well as some curatorial work, we also had a chance to help out in the Pleistocene (2.5 million years to 11,000 years) Fossil Mammal Collections, as well as have a look at some of the strange animals found in the Cephalopod (Squid, octopus, ammonites etc.) and Brachiopod Sections (and work out what a Brachiopod is, which I now know is a marine invertebrate with two shells which look different to each other, but both are symmetrical). Derek Oakly (L) and James Appleby (R) looking for type specimens described by Woodward in the Fossil Fish Section. Dr. Zerina Johanson, a fossil fish researcher, showed us the fish that she has been working on. What were especially interesting were the exceptionally well preserved fossils from the Gogo Formation in Western Australia. By the Thursday we had finished the work on Woodward’s fossils, so watched a Nature Live talk about fossil fish by Joe Keating in the afternoon. I was given the opportunity to work alongside James at the Natural History Museum for a week. Our main focus was to help contribute to the Woodward150 symposium on 21 May. We were able to go through his many fossilised fish specimens and notes that are not seen by normal members of the public, and it was great! Alongside this we was able to experience different areas and collections behind the scenes, including a tour of the Brachiopod Collection. We also helped in the Fossil Mammal Section and gained a deeper understanding to some of the research that is conducted here. We were also able to help contribute to a Nature Live event, where we collected the many fossils to be shown and discussed with the public. I would like to thank James and Derek for all their hard work during the week and I am sure they will go on to do great things in the future. If you are interested in doing a work experience week with the Museum, have a look at our website. Places are limited and generally oversubscribed, but it will be a very worthwhile and rewarding experience. As some of you might be aware myself and colleagues are organising an upcoming symposium to celebrate 150 years since the birth of one of the great palaeontologists - Sir Arthur Smith Woodward. Smith Woodward might not be as well known as others but he did a lot for palaeontology, particularly fossil fish. Smith Woodward was born in Macclesfield on 23rd May1864. 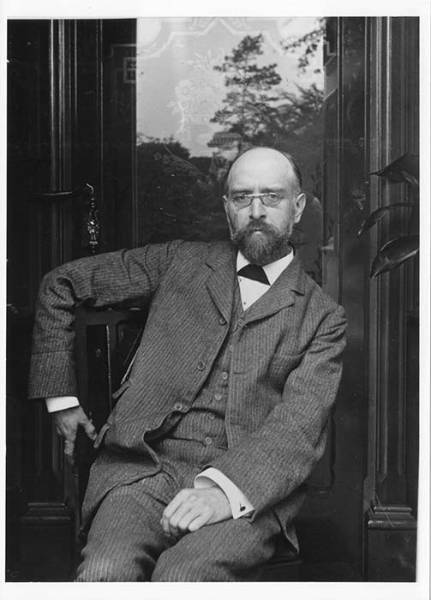 He started his long career at the NHM (then the British Museum - Natural History) when he was 18 years old in 1882 in the Geology Department. At this point the NHM had only been opened to the public for 16 months, so there was lots to do. When he started at the Museum he quickly became involved in fossil exhibitions. Around the same time two large collections of newly acquired fossil fish specimens (containing thousands of specimens) previously belonging to two prolific collectors arrived at the Museum - Sir Philip Grey Egerton and William Willoughby Cole, (the 3rd Earl of Enniskillen). Smith Woodward realised how important these collections were and there were likely to be lots of new species and interesting specimens. 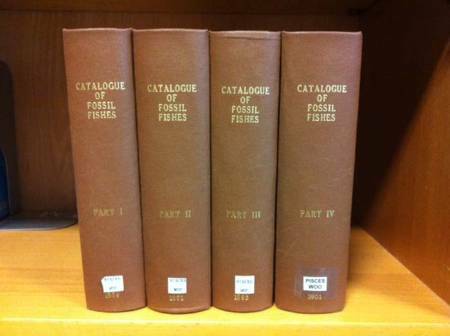 During his time Smith Woodward named over 300 different species of fossil fish and perhaps what he is best known for amongst fossil fish workers is a four part Catalogue of the Fossil Fishes in the British Museum (Natural History) published between 1989 and 1901. This was and remains a very important reference for fossil fish workers. I often refer to the Catalogue on a weekly basis for information about specimens. He also published on fishes from Wealden, Purbeck and the Chalk. Much of his work helped to form the foundations of current research on numerous fish groups. Smith Woodward became Keeper of Geology in 1901 and spent his entire career here at the Museum, retiring in 1924 when he was knighted! He died in 1944. Over his lifetime he received many awards and medals including being made a fellow of the Royal Society in 1901 and the Lyell and Wollaston Medals of the Geological Society (there are actually too many to name here). During the symposium we will have several talks about who he was as a person, his contribution to science and how his work has inspired generations of palaeontologists. There will also be poster contributions and a rare chance to see some of his type material described in the Catalogue and other key publications along with some of his many medals, which are kindly on loan to us from the British Museum. The meeting will take place on Wednesday 21st May in The Flett Events Theatre of the Natural History Museum. Places are still available if you are interested and it is free to attend. However, you must register via the website. Watch out for further posts about Smith Woodward and how the symposium went. We will also be working to produce a Procedings with a wide cross-section of papers next year. On the day I will be encouraging delegates to tweet and I will be doing the same from the Fossil Fish account and using the hashtag #ASW150.